Mckfresh are back! 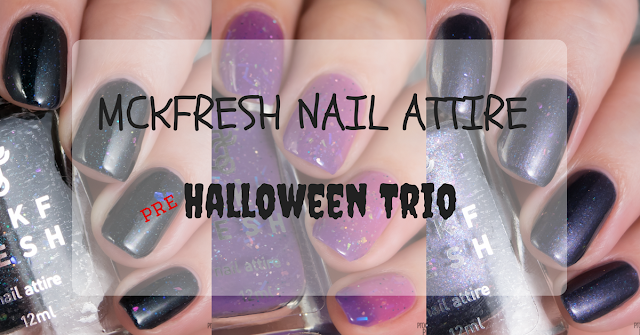 They've been back for about a month and they've recently released a bunch of new shades including special shades from Aussie Indie Con, new super limited shades, a revamp of an old Mckfresh fave and of course, the three 'pre-Halloween' shades you're seeing today! Black based blurple shimmer with a generous dash of multichrome flakes. The moody dark base is lifted by the cool shimmer and the pops of colour from the flakes are nicely balanced. Black jelly loaded with glitter and shimmer and multichrome flakes. It's like the night sky during a comet shower, full of unexpected bursts of colour in the deep dark blackness. I'll forever adore black jellies filled with colour and sparkle so this one is a total winner for me. 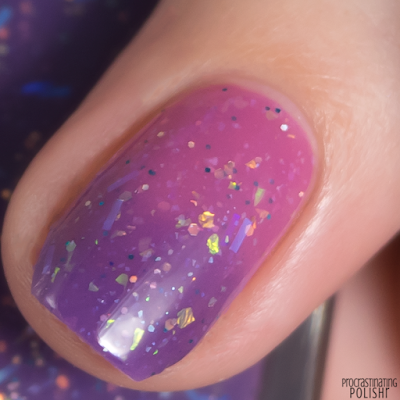 For a jelly I was impressed with how nicely pigmented it is while still keeping the squishy jelly quality. It's opaque in three coats and for the most part is a fuss free formula that applies easily - however I did have one troublesome flake that needed a prod to lay flat. I used a good thick fast dry top coat for a good squishy finish. A three phase thermal filled with all kinds of iridescent glitters, including hexes, flakes and bars. Starting at the warm state it's a bright pastel pink, shifting to a blue leaning purple when cold and almost black when super cold! I'm pretty warm blooded and usually struggle to see the cold state of thermals, but this shifted easily and frequently between pink and purple - though I needed to really get my hands icy to get that black shift. For the anti-bar glitter crowd out there, believe me when I say these bars are different. They were no different to work with than iridescent flakes and they laid flat on the nail without effort. Overall the formula is great, self levels really well especially considering the glitter load. I used three thin coats for full opacity, and topped with a thick fast dry top coat. These three polishes are available right now from Mckfresh Nail Attire on Etsy - but get in quick as they are in very limited supply!